But all of these knobs and settings are staring back and grinning, daring you to even try to understand what they do. Have no fear. With these 23 EQ tips, you'll have a broad overview of what the knobs do and what must be done for your music to rival the professional mixes. It's nowhere near as scary as it seems on the surface. Don't over do it. Less is more! Equalization lies somewhere between the realms of art and engineering. You first need to know the main methods and approaches, which we offer you here in quick tip fashion. Beyond that, you need to trust your ears. Insecurity and second guessing will cause you to destroy what's probably a more-than-acceptable mix. Finding a similar sounding song with an orchestration resembling yours will give you a baseline mix to try to emulate. The only battle is knowing how to move the dials to inch closer and closer. ...to massage your song with an equalizer until it sounds just like a release from your favorite artist! These are listed in no particular order. They are all as important as the previous one. All an equalizer does is let you change the volume on a specific range of frequencies. Like any volume knob, you have two choices: up or down. In the EQ realm we call these boosting and cutting, respectively. Cutting (dropping the volume) is generally a better option than boosting (increasing the amplitude). Why? For one, you've carefully crafted your gain staging in the recording process to cram the most detail into your digital bits. If you boost too much, you'll end up needing to turn the track down. You have enough headroom for boosting and I'm not at all saying don't boost, but the disadvantage is that you introduce artifacts, distortions, and reduce your resolution by pushing it through the roof instead of freeing up headroom. It's like listening to music on your computer. You have the software volume and you have your speaker volume. If you push your software's volume way up to the point that the audio is clipping, you can have severe distortion even though your speaker volume is set to a whisper. Typically the issue with any track is a narrow band of frequencies that you want to reduce. When you boost a wide range it may mask that troubling range but you've reduced all other frequencies in volume in the end when you compensate by reducing the volume for that track later. Instead if you laser focus and train your ears to find the bad frequencies and work only on them, you'll end up with a much more natural and pleasing mix in the end. To find these troubling frequencies, set your Q to be very narrow. The Q is the width of your EQ curve. Make it thin and add a 7-10 dB boost to it. Slowly sweep it up and down the frequency spectrum until that nasty sound you're hunting for pops out like a sore thumb. You'll know when you find it. At that point widen the Q just a bit, staying centered over the worst frequency, and then drop the boost to a cut. Again, slowly reduce the volume until it hides the bad sound without disrupting the natural sound of the instrument. If you chop it completely out things will start to sound weird. Most instruments have no business muddying up the low-end. Guitars, ambient hums, etc... Even the best mic stands will allow rumbles to travel up into the mic. All of that can be cut out by slapping a high-pass filter and most instruments. Not only does it knock most noise out of your mix but it frees up space for your bass and kick drum fundamentals and harmonics to be heard more clearly. You can learn more about dealing with this area, which is troublesome for most newcomers, in our Low-End Balance article. In the same vein, as you're making precision cuts in the middle and higher frequencies, you can slap a high pass filter on the master output for less distraction and aural clutter. There's a lot of energy going on in the low-end that might mask some problems you need to fix. You might not be aware of them with the bass and kick thumping. But your listener on tiny headphones or cruddy computer speakers will hear every bit of it since they won't be hearing the bass as well. Make sure you dig in and fix all of that by removing the low-end distractions. Don't just mute the bass and kick though! You need to hear their harmonics in the mids as they compete with everything else. Once you clear out the space, you can work with cymbal, snare, chimes, etc., more clearly. Getting the sparkle up there is a very delicate process. Overdoing it can mean ruining an entire mix. Nobody can stand ear-piercing sounds no matter how good the rest of the mix is. Clear out some space so you can make the right calls. As you've likely gathered at this point, most of the action occurs in the mids. The bulk of your time will be spent here performing the precision work of a musical brain surgeon. No matter if the orchestration is sparse or dense, no matter if the genre is electronic dance music or bluegrass, no matter what speakers or headphones someone is using, the action occurs right up the middle. Most of the tips from here out will deal with the middle or supporting the middle. Strap in, buckeroos! Many times you'll have crafted the perfect mix. The mid range will be a masterpiece but the orchestration is lacking "oomph." It feels weak, anemic, and thin even though the bass is perfect. Let's take the example of the Bluegrass genre again. Your stand-up bass sounds great but the mandolin, banjo, guitar, vocals, and harmonica have next to no bass in them. You can't compress the stand-up bass any more. You can't boost it's frequencies to flesh out the low-end without losing definition. But what you can do is add some meat to the other instruments. You can sweep a medium Q with a slight boost around to find the fundamental frequencies of the other instruments. Once you find them, you can leave a tiny boost on them if you like if it adds a weight to the body you like. Also try doubling the frequencies or halving them and boosting a bit there. So if you find that 200 Hz sounds good with a 3 dB boost, try adding 1 dB at 100 Hz and 400 Hz as well. The goal is to thicken up the spectrum around 100-500 Hz to provide more warmth. But watch out for muddiness and boxy sounds. Your goal is to make each instrument sound good in relation to every other instrument. Your listeners can't solo or mute any individual sound. They have to take it all in the final bounce. So as you're making decisions on each track about what to cut or boost, make sure you're referencing the entire mix as much if not more than each in isolation. This is a silly analogy but it works and uses the word "mix." Sugar tastes great alone. But if you put too much sugar in the cake mix, you're going to ruin the cake. Same goes with the salt, chocolate, and whatever else goes into cake. Balance is everything, and that is only achieved in relation to the whole. Every sound in a mix must accommodate the other in a harmonious fashion. Each has to exist together, making space for one another... except the lead. The lead is everything. It gets all of the attention. And the lead can change throughout a song. It might be the vocals during the verse and chorus, but then the bridge comes and the guitar shreds a solo only to drop back and let the synthesizer rip the last half of the solo. There is no one size fits all EQ setting for the entire song. But the main point here is that the lead doesn't dodge and accommodate other sounds. They make room for the lead, which is up front and center and full of life. Don't start hacking a ton of frequencies out of the lead vocals because you want to hear the rhythm guitar better. As a professional or hobbyist mixing his or her own songs, there's no need to start from ground zero on each mix. You don't unplug and rewire your patchbays before every recording session. You don't break down and reset up your session drum kit each time. And you don't need to start mixing with your multitrack's plugins all disabled. You can save a skeleton project template that has the inputs mapped to the outputs of your interface and labeled appropriately. Each of those can have your basic bass roll offs and high-end cuts in place already. Each can already have compressors set on them but turned off. You can route auxiliaries to effects buses. There's much you can have ready to rock and roll before you ever hit the record button, let alone start mixing. Be thinking about this over time and you'll realize what your "go-to" operation is and how you can cut some ramp up time out by saving track presets and project templates. There's all kinds of ways to goof up a solid procedure. You may perform all 5 steps correctly by themselves but since you did them out of order the end result is an absurd abomination. Let me preface this by saying that as you read about other mixing techniques across Ledger Note some of this will seem contradictory, but this is good advice for beginners. Learn these as rules before you break them as advanced techniques. The best example is to EQ before you compress. You want to remove unwanted sounds first so that they aren't boosted in volume by the compressor or the cause of the compressor engaging. 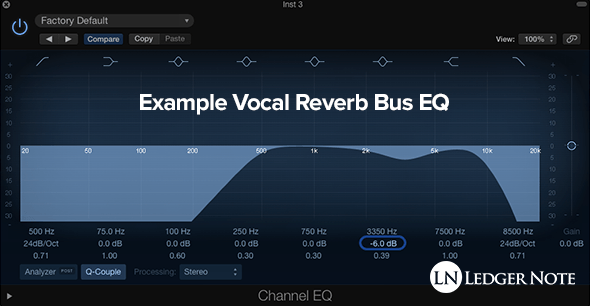 You'll want to EQ your track before you apply effects like reverb and delay. Every mixing method and tool relies on the sound itself. It always makes sense to equalize first so that the tools are working off of your desired result, not off of the raw and untreated recording. This way, you can compare your recent tweak to the previous setting immediately to gauge whether it was a good or bad move. You can also bypass the EQ altogether to make sure you're not destroying the sound. It's easy to chase an idea down and not realize you weren't even on the right path. Comparing and contrasting is the key to improving. If you can't compare your tracks to themselves, you can compare them to reference material like a similar song that is mixed well. Don't fly blind! This is just like the boosting conundrum. Most everything sounds good loud. Don't sign off on the mix and send it to the press just yet. It needs to sound great at normal volumes and low volumes too. The low-end tricks me every time. I'll get close to a final mix at regular volumes and then crank up the volume to make precision changes in the balance of individual volumes. When I drop back to normal and low volumes, the mids and highs sound amazing, but there's always too much bass. The same goes for allowing volume to fool you into thinking undesirable frequencies have been tamed well enough or are masked by other sounds. Not everyone listens at high volumes or from the mix position in front of decent monitors. You have to fix it all properly at every volume! This problem occurs due to our sensitivities to different frequencies at different volumes. You can learn more about that by taking a look at the Fletcher Munson curve. So you think you've balanced everything out with your EQ skills. Any track that might have clashed or gotten in another track's way is panned so that it doesn't. The mix sounds great from your special mix position. But guess what? We still don't hear everything in stereo these days. Many radio stations will broadcast in mono with extreme compression. A person at the club may be standing off to the side and far away from the speakers so they essentially act as a mono source. A person may turn on your album in the living room and crank it up so they can hear it in the kitchen as they prep dinner. Mono is everywhere! The best way to deal with this is to look in your DAW's multitrack on the master channel and find the Stereo/Mono button. Most will have it, but if not there will be a default plugin you can drop in to pull it off. Otherwise you may have a monitor controller with a mono button. The point is that panning across the stereo field only fixes equalization issues for people wearing headphones or seated in front of speakers set up properly. The guitar panned -25 to the left and the keyboard +25 to the right don't clash at all in stereo so you never EQ'd them to make room for each other. But then you drop to mono and realize not only are their volumes completely out of whack, but they occupy the exact some frequencies. You have a mess on your hands! Back to the drawing board. Mix in mono often. Reference your mono switch constantly. You can do most of your EQ work in mono entirely before you ever think about panning if you wish. Just use it! You don't need to know how to build a car engine before you feel like an authentic car driver. And you don't have to create your own EQ settings from scratch each time. Many plugins come with settings that will get you close to your desired result for that specific instrument. It likely has 20 settings for male vocals, 20 for female vocals, 20 for snares, and on and on. Let these presets teach you and save you time. Professionals made them. But don't accept them as the end-all-be-all. They are starting points that you must adjust. Every mix is different. Don't have a heavy hand when performing precision work, which is what equalizing is all about. Avoid massive cuts & boosts beyond the 3-5 dB range. Find the right setting for your high and low roll offs and then back them off just a tad. The same goes for the volumes of effects. A great rule of thumb when mixing is: Find the right setting and back it off just a tad. Less is almost always more in compression, effects, and especially in equalizing. 18) Why Compete When Everyone Can Win? Notice in the image below how the kick on the left side has a slight boost. Then on the same frequency we applied a slight cut to the bass. This lets the kick have it's own small region to define itself. They both still share the rest of the spectrum but the defining sound of the kick resides there and it needs to be able to thump with clarity by owning it. Another trick you can apply is side-chaining a compressor to the bass so that only those frequencies are ducked on the bass when the kick fires. It's very similar to a de-esser on vocals. You can cut and boost on competing instruments so they can dominate their defining frequencies while still sharing them with other instruments. By making it easier for the ear to latch on to this definition, it can more easily pluck out the harmonics. This provides a sense of clarity. This is the bane of all amateur mixers. The reason is it takes a lot to even be equipped to deal with sub-bass. Not only will you need plenty of acoustic treatment in the form of bass traps, but you'll need a good subwoofer capable of producing the sub-bass. You’re far better off with less or no sub-bass than too much - if you don’t have a treated room and a subwoofer, professional mixing headphones can help but their woofers will be too small to let you form the perfect sub-bass. The main concern is that most listener's speakers and headphones won't have good enough amps to drive the woofers hard enough to produce sub-bass properly. But they'll still try and this will introduce distortion in the other frequency ranges at much lower volumes than you'd expect distortion to start occurring. Too much is never good. Too little is okay. Any bass fiends will EQ their own extra bass in on their side anyways. Your safe bet is to get it as close as you can and then reduce it until you're better equipped to deal with it in your mixing environment. This tip is important enough to be given its own slot although it was mentioned before. Apply your EQ first and then move to compression. Imagine having some play dough full of rocks. This is your raw track. You want to pluck those rocks out first before you form your model dinosaur. If you make the dinosaur first and then pull out the rocks, you'll have an oddly shaped figure with holes in it. Equalization is the act of removing the unwanted rocks before you shape the sound with compression. Compressing before equalizing creates a mess. Then as you try to fix that mess post-compression, you only make it worse. Learn about auxiliary tracks that you can use as effects buses. This saves your computer a ton of processing power. Instead of applying the same reverb 12 times to 12 tracks, you can send those 12 tracks to one bus with one reverb. What this also allows you to do is apply an EQ to the reverbs and delays as well. You'll have EQ'd your sounds before applying reverb, but reverb is purposefully lush and spreads out across the spectrum. While it's based on the sounds you feed it, it still has a sound of its own that grows beyond your original intentions. You can trim out the tops and bottoms of the reverb as shown above and even cut out holes for the lead instruments and any other sound that is suffering from clarity issues after applying the reverb. Also, remember to set it where you think it sounds good, and then drop the volume by 2-4 dB. This reverb bus EQ will not only glue your sounds together by using a single reverb, but will allow you to create a lush soundscape without screwing up the mix. A little known fact about panning is that it drops the volume the further and further you get to one side. Panning entirely to the left or right will drop your volume around 3 dB, and you need to compensate for that if you set your volumes in mono first. This is why the mono trick mentioned above is a must. It will show you that your finely tuned volume decisions are as wrong as your equalization decisions, because you allowed panning to trick your ears due to your privileged seat in front of your nice monitors. Wait a second... Yes. I said panning introduces and reduces EQ problems. It's not a contradiction. It's all about the listener's vantage point. You need to EQ to account for mono situations. But you can also be less severe about it by taking advantage of panning. You can't win every battle, but you can find the best compromise. LCR panning refers to the practice of only placing tracks up the center, far left, and far right. The only sounds that should exist in between is reverbs and maybe some percussion. Of course your vocals, kick drum, bass, snare, and any other lead will always be up the center. But the left and right options give you leeway to move competing sounds as far away from each other as possible. This technique is an entire can of worms for another post but one you can start toying with immediately. You'll begin to notice it here and there as you explore newer releases, especially in the modern Pop & Rap genres. Equalizers are your main line of defense in the war of mixing. While software emulators are fun, there's nothing like routing to your best hardware equalizer and bouncing back in. But in the end it doesn't matter how you get it done as long as it's done and done right. And that's where these 23 EQ tips come into play. Let them serve as guidance on how to use this tool. Mixing with EQ doesn't have to be hard any more!